The younger of twin brothers living in Tazmily Village in the Nowhere Islands. He’s a kind boy who can communicate with animals, but he’s shy and never really got over the tragedy that struck his mother. He fights a warped dictatorship and hunts the Seven Needles, using PSI attacks to do things like absorb enemy projectiles and deal supernatural damage! Quite frankly, Lucas is outclassed by Ness in almost every way: his PK Fire lacks combo potential, and his PK Thunder is relatively weak. 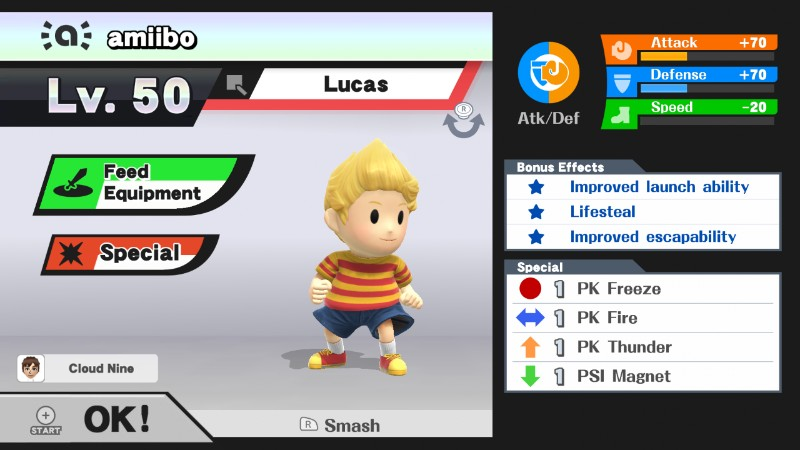 Even so, Lucas has many advantages of his own; for one, he has an excellent set of smash attacks. His forward smash comes out fast and can reflect projectiles, and his up smash is one of the strongest aerial punishes in the game. As mentioned earlier, Lucas’ special moves are inferior to his red-clad counterpart’s, but they do have several unique properties. PK Freeze can temporarily immobilize opponents, while PK Fire can be used at a distance to keep enemies away. 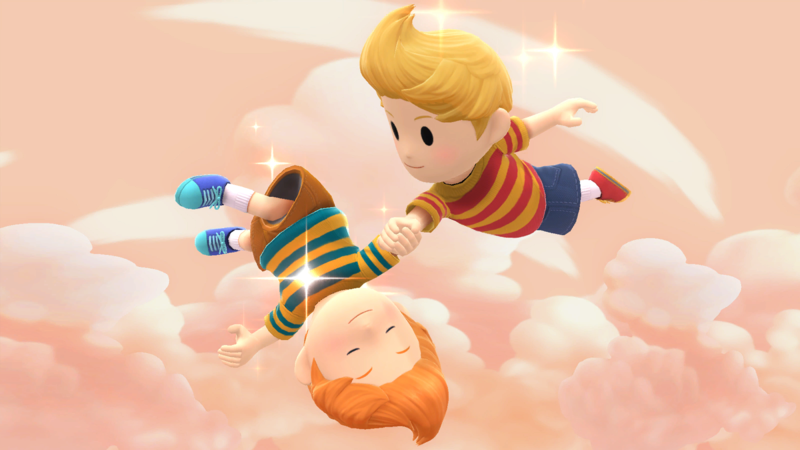 Lucas’ recovery also far surpasses Ness’ – in addition to having a tether grab, his PK Thunder travels much farther. Being a semi-clone of Ness, Lucas shares several of his flaws. Although Lucas’ PK Thunder flies farther than Ness’, it can still be interrupted. Among others, Mario, Link, and King Dedede can continuously delay Lucas’ recovery with their respective projectiles. Additionally, platforms on stages like Battlefield block PK Thunder, which leaves the character vulnerable. Lucas’ biggest flaw, however, is his AI, which is notoriously difficult to work with. It may overuse its grab aerial, PK Fire, and PK Thunder – in the case of the latter, it occasionally fires itself off-stage, which leads to an otherwise avoidable self-destruct. Lucas’ frustrating AI problems make him tough to raise. Most trainers prefer to stick with Ness, whose training is relatively straightforward. It might seem unfair to compare Lucas to Ness, seeing as they’re two different characters, but when you look at their tournament standings, it starts to make sense: Ness has especially notable results, while Lucas has almost none. Neutral options: jab, forward tilt, and down tilt. Lucas’ jab is a simple but effective neutral option; it racks up damage quickly and can get him out of tight situations. Compared to his jab, forward tilt deals more damage, has increased range, and can be angled. Down tilt serves as a reliable combo starter, and can link into a jab, forward tilt, or forward smash. Main KO moves: forward smash and down smash. 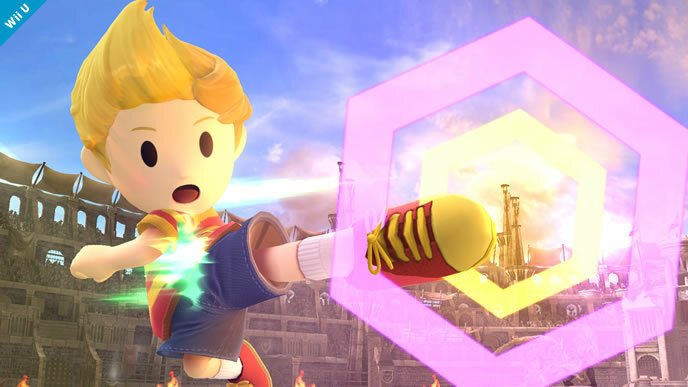 Lucas’ forward smash is powerful, disjointed, and can reflect projectiles if timed correctly. His down smash strikes three times and launches opponents at a horizontal angle – this can spell doom for fighters with poor recoveries. Lucas’ up smash is incredibly strong, but its atrocious ending lag makes it a risky option. Moves to avoid: grab aerial, PK Fire, and PK Thunder. If you overuse these moves during training, there’s a high chance that your amiibo will learn to spam them to no end. PK Fire is useful at specific distances, but it need not be taught: your Lucas will learn the proper timing on its own. Use PK Thunder for recovery purposes only. Your amiibo may sometimes launch itself off-stage and to its death – if this happens, don’t quit the match – let him suffer the consequences of his actions. Situational moves: PK Freeze. 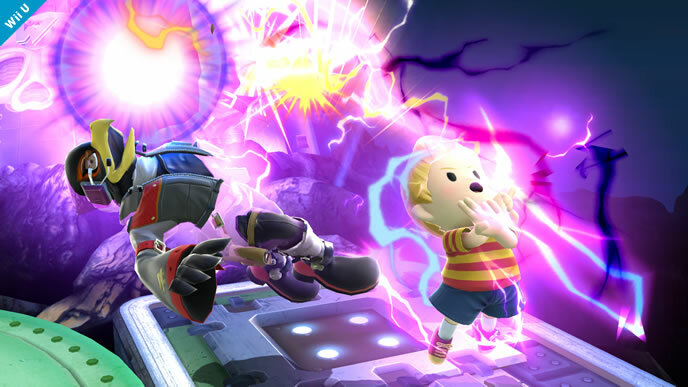 PK Freeze is one of Lucas’ best moves, and it becomes even stronger with the Improved launch ability bonus. With proper timing and spacing, it can score early KOs. If you successfully freeze your amiibo, follow up with repeated forward smashes. Utilize forward throw, up throw, and back throw as secondary KO moves. Each of these throws are among the strongest of their kinds, and can serve as quick finishers in a pinch. Thanks to Blue for compiling Lucas’ information. Images are courtesy of SmashWiki and the official Super Smash Bros. website.